By the late 1960's both Volkswagen and Porsche were looking to expand their business and venture into new markets. VW wanted to move more up-market whilst Porsche need a volume model to break into the US market, enter the new Volkswagen-Porsche 914 and 916. 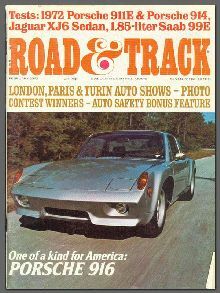 Despite being expensive and often criticised by Porsche enthusiasts the 914 and 916 sold in large numbers, mainly in the USA until 1975.